If you are a fellow artist, sketcher, watercolorer etc, please leave a comment to sign my Guestlist. I would love to see a link to your site and see what you are up to! It was great to meet you at Johnston Architects! I love your sketches- ink and watercolor is such fun. Do keep me posted about your endeavors. It’d be great to see you again! Hi Erin! I stumbled across your sketch of Guanajuato and loved it! I live in San Miguel, also a drop dead gorgeous small town in Mexico, near Guanajuato. I love your work (or is it fun) but alas, I’m a photographer. However, I wanted to sketch some of my fotos so they have the look and feel of your art. 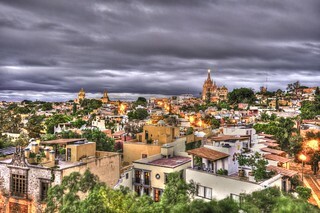 I shot this foto of San Miguel de Allende Mexico one evening a few weeks ago.